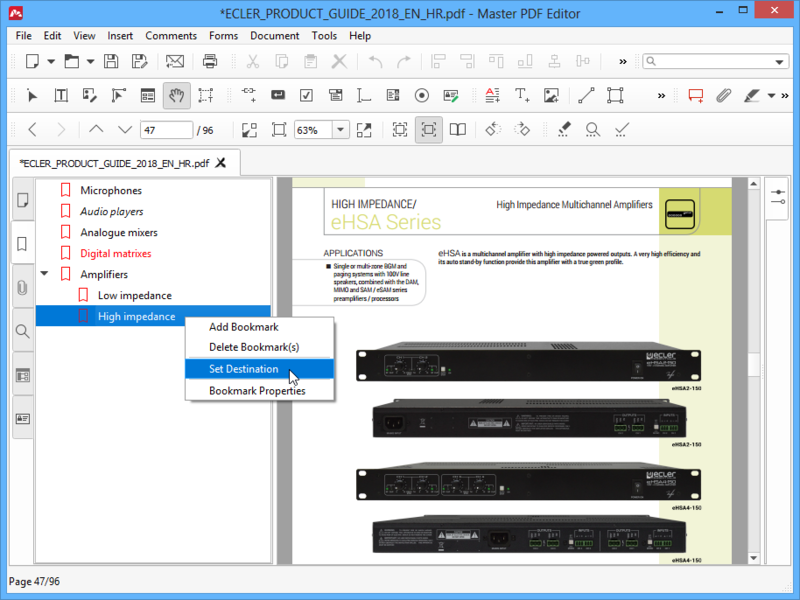 To add a bookmark to a PDF document, click the Bookmarks tab on the side panel. Then right-click the panel and click Add Bookmark. 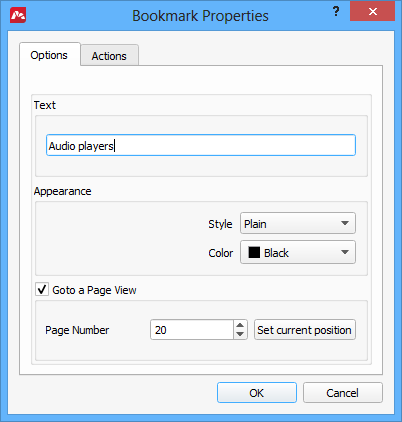 The bookmark properties window opens. Enter the text of the bookmark providing enough information about where it points to. 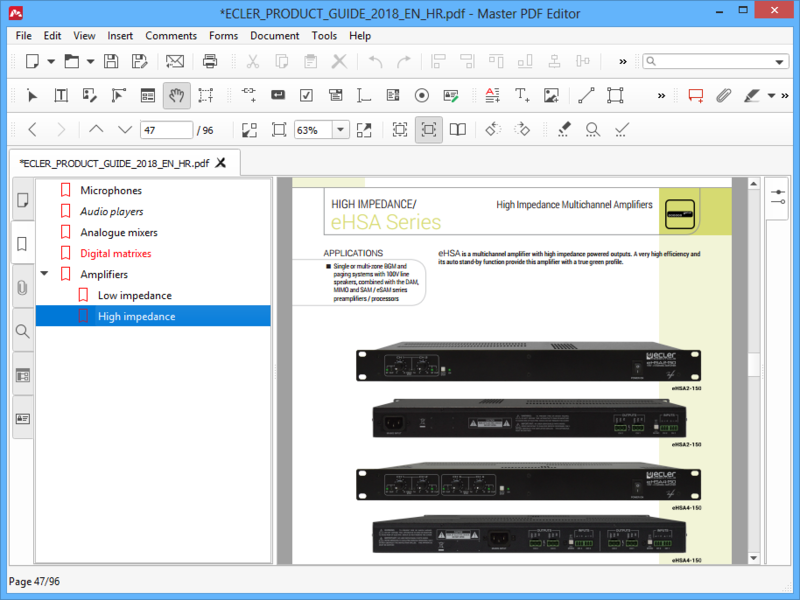 Optionally, adjust the appearance of the bookmark. Click OK to create the bookmark. You can also adjust position of a bookmark in the tree by dragging and dropping it. To delete a bookmark, right-click it in the list and click Delete Bookmark. or hold Shift and click the first and the last bookmarks to select all bookmarks in between. 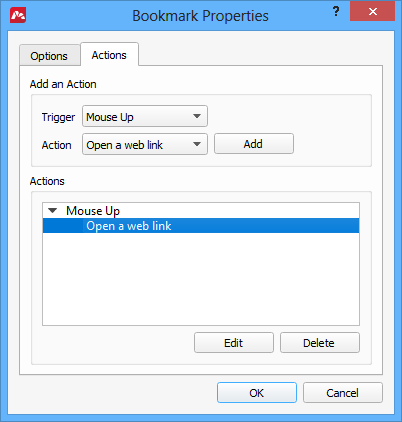 Then right-click and click Delete Bookmark to delete all selected bookmarks. 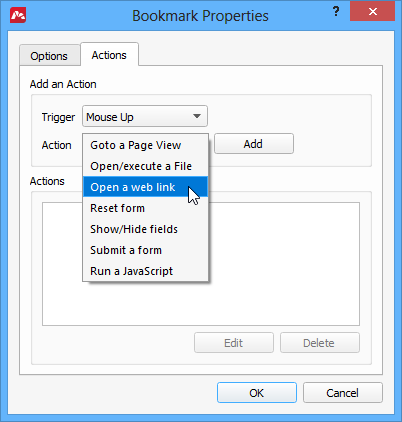 To edit a bookmark, right-click it and select Bookmark Properties. If you just want to assign a different page view to a bookmark, navigate to the part of the document you want to bookmark, then right-click the bookmark in the list and select Set Destination. 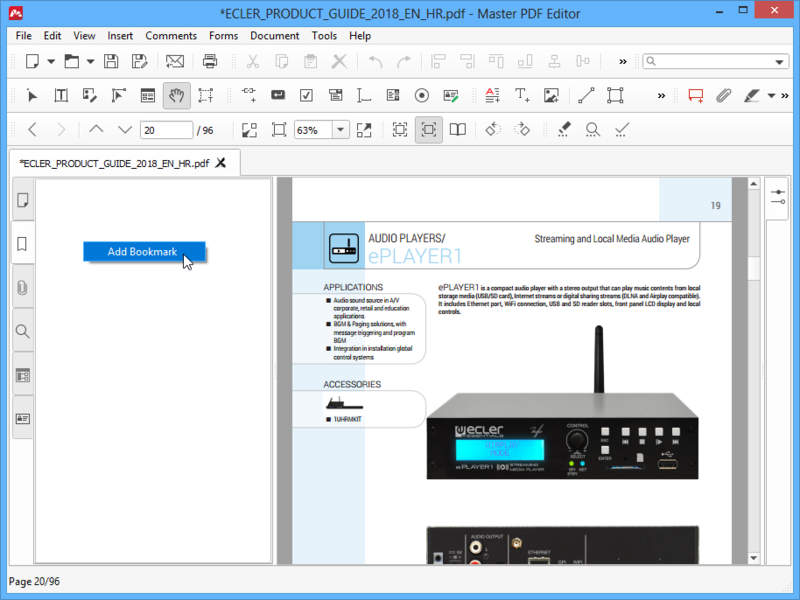 NOTE: the bookmark saves both the position in the document and its current zoom level. Setting a new destination will also save the current zoom level. Whenever you click this bookmark, it will adjust the scale of the document back to its saved state. Right-click the bookmark and click Bookmark Properties. Switch to the Action tab. Select Goto a Page View action in the list and click Edit. Select Custom in the Zoom Mode dropdown box and set Zoom to “0” (“auto”). Click OK.
Read more about setting actions to a bookmark below. For example, here is how you can make a bookmark open a URL. Right-click the bookmark list to add a bookmark. 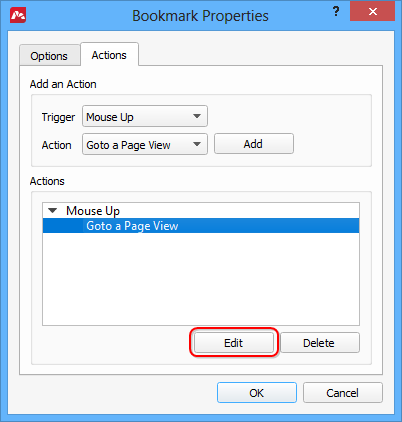 In the Bookmark Properties window switch to the Actions tab. Select the action you want to perform when the bookmark is clicked. In our case we want to open a link, so select Open a web link item. Click Add. Click OK to add the bookmark. Note that you can assign multiple actions to the same bookmark. In this case all of the actions are executed starting from the first one. Go to a Page View. The default action that navigates to a specified place in the document. Open/Execute a File. 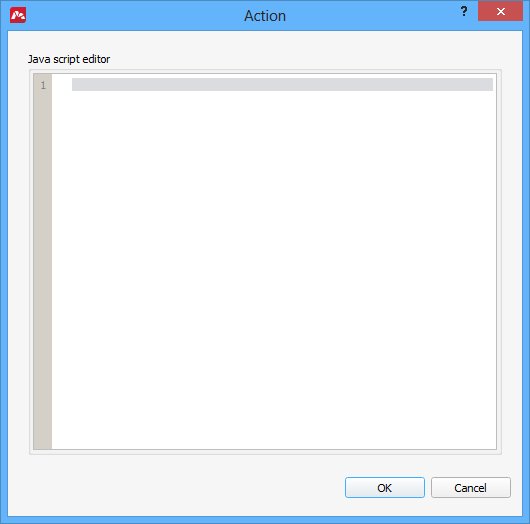 This action opens a specified file or runs a executable. Open a web link. 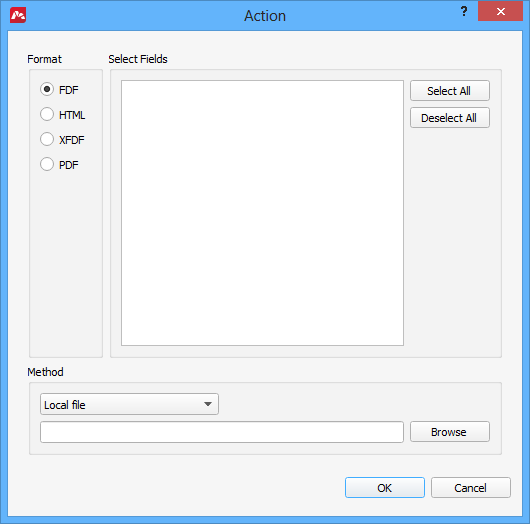 The action allows you to open any URL in the default browser. Reset form. Select fields of a PDF form or forms to reset. The contents of these fields will be removed. Show/hide fields. You can select which fields of a form or forms should be visible. When this action executes, the selected fields will turn their visibility as specified. Submit a form. This action allows you to initiate submitting of the selected fields of a form using on of available formats and submission methods.